The answer is a resounding yes I do indeed. It isn’t just birthday parties I can also perform for halls with as many as 200 people or a class of only 15 children. I mix up my performances and have lots of interaction and volunteers to help with the magic. don’t just take my work for it you can see lots of reviews and photos on my Facebook page as well as on Netmums. 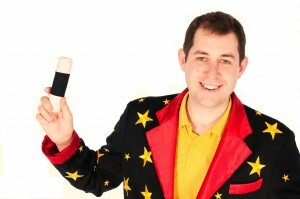 When booking a primary school entertainer, what should you look for? Simple, will they turn up, are they professional? will they supply an invoice? are they police checked? are they insured? These are just some of the questions that you should be asking. I make sure I am all of the above. This is just one of the reasons why I get invited back to perform at the same school time and time again. I am also extremely helpful, so if there is any questions, suggestion or idea that you may have please get in touch. You can email me on alex@alexmagic.co.uk or call 07890 217 203…. So what are you waiting for?